My husband is in Las Vegas for his fantasy football draft (but given how seriously he takes it, I don't think it's much of a fantasy for him). Consequently, I have a very quiet Saturday planned. I woke and drank a pot of green tea. Then, I prepared and ate my simple, yet perfect breakfast (one egg, one slice of Ezekial toast, sauteed baby bok choy with low sodium tamari and sesame seeds, raspberries). I also did yoga on my porch while the sky thundered and rained a little bit (the first rain we've had in as long as I can remember). I'll spend the rest of the day doing a little work, writing my recipe column for Patch, and organizing my office. And perhaps I'll come closer to finishing A Dance with Dragons (I've been reading this series for the better part of the last five months, but it's drawing to a close soon). And I'm addicted to Salon's Life Stories, and am reading through the entire archive (I love personal essays). I also decided to make one of my favorite recipes for dinner tonight: Curried Lentils with Sweet Potatoes & Kale. I threw all of the ingredients into my slow-cooker instead of cooking them conventionally. I'll let them simmer and stew away all day, and then eat them over brown rice. And perhaps with a side of garlic naan as a special treat (from the freezer section at Trader Joe's). This will be a comforting, healthy dinner. 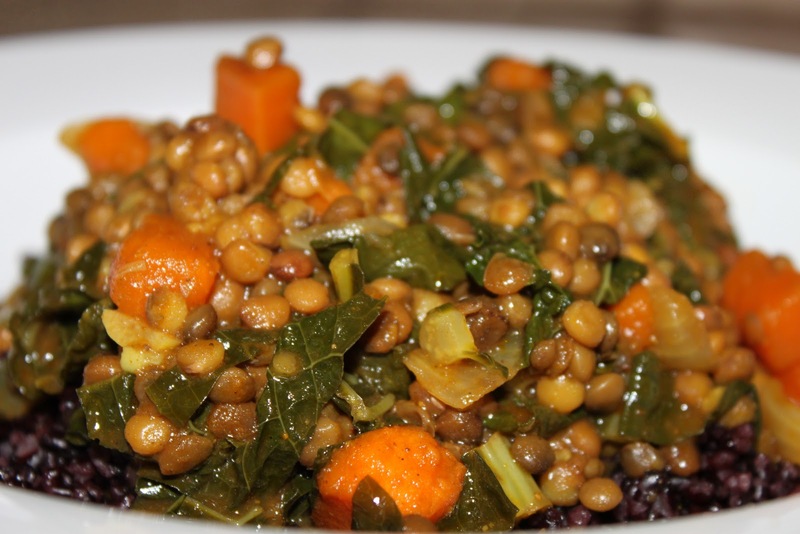 I love the hearty, earthy combination of lentils, sweet potatoes, and kale. To a lovely weekend for us all, filled with joy, comfort, and most of all, good food! Update: I ended up meeting friends last minute at Son of a Gun for delicious cocktails and dinner. But this dish made a fabulous lunch the next day! this looks and sounds amazing, can't wait till our weather starts to cool down so I can get the crockpot a cookin! "I also love using my slow-cooker because at the end of the day, it feels like somebody has cooked dinner for me..." Love love love this line, I used to be enamored of my DVR for being so reliable, but in my post-tv household its time to get a slow cooker like you & my sister. Thanks for the recipes ahead to try very soon.